A record 80,000 people came into Florence from all over Tuscany on the vigilia, to take part in this magnificent party. The streets were flooded with people, the stores stayed open all night....even the museums were open until midnight. The whole city took the day off to join in the stunning display of pomp and circumstance recognizing the "unifcation" of Italy in 1861. But how many of them showed up to demonstrate their patriotism, and how many of them were following their Italian instinct to "festeggiare"? I staked out my spot on the Loggia dei Lanzi an hour before the fireworks display to ensure my view of Palazzo Vecchio. As I waited for the show to begin, I thought of how lucky I am to have "re-found" Italy. How lucky I am to be here in Piazza Signoria, gazing up at my town hall on this momentus evening. 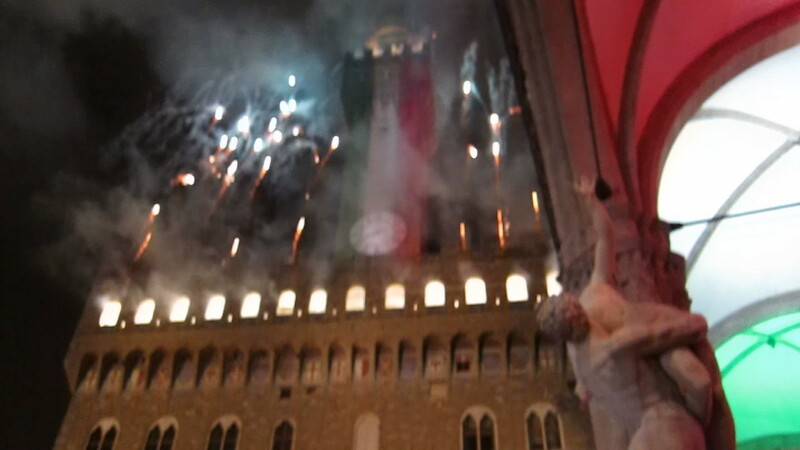 But at the same time, I had mixed emotions about the celebration of Italy's 150th birthday. Although the crowds were captivated by the excitement of the festivities, the sense of patriotism appeared to be absent, or superficial at the most. As the orchestra played Il Canto degli Italiani, almost nobody sang, though the fireworks and glitz really dazzled. I am sad that many Italians do not share my pride. The Italian-American experience is diametrically different than the present-day Italian experience, and this really affects our relative perception and appreciation of Italy's greatness. The current political regime unfortunately contributes to this negative pride. Italians have made countless contributions to the development of America's history, economy, culture and politics without which America would not be what it is today. What the Italians did for America they can do for Italy. Italy's destiny depends on its youth to make changes, as the older generation is tired and apathetic about its situation. This is one of the reasons why I have so much belief in young politicians such as Matteo Renzi, who instead of being criticized for his recent dallying in national and international politics, should be encouraged to bring his local success to the next level. I am proud of my Italian heritage to the point of deciding to "reverse-immigrate" from the U.S. to Italy. I am equally proud of being American, although I think that America's obsession with material and economic gain has backfired and has caused Americans to lose sight of certain values and attitudes that still thrive at the core of the Italian culture. I am sorry that Italy remains in many ways as divided as it has ever been. I do not believe that Italy can survive only through the hope of remaining happily regionalist, or that being disunited is "okay, too". Italians lack solidarity because they don't believe they can change things, but also partly because they fear the loss of their local identity. Clinging to this myopic view may be comfortable, but can dangerously inhibit the country from addressing the gargantuan issues on its plate. It doesn't need to be "Black or White". The goal should be to simultaneously preserve the local cultures while contributing to the betterment and strength of the whole. I pray that Italy will cultivate new young leaders who can help it overcome its division while still maintaining the flavor, diversity and customs of its many pieces, in order to confront the domestic and international challenges that it faces today. I think the celebration of its 150th birthday is a positive step towards the realization of this goal. Viva l'Italia!